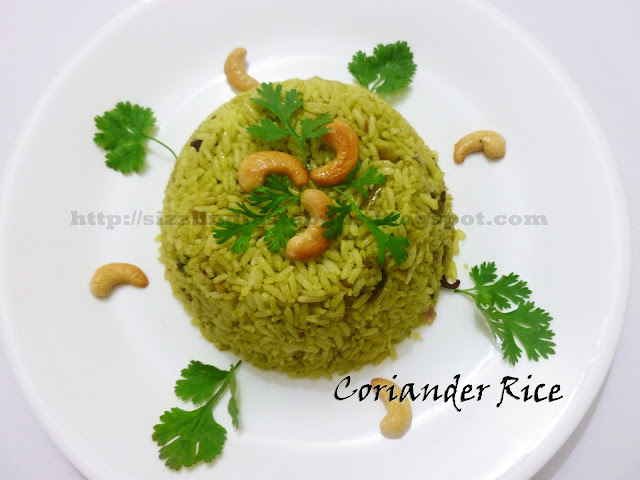 Coriander Rice is a very easy and simple Rice dish which can be prepared in very less time and with very less ingredients too. 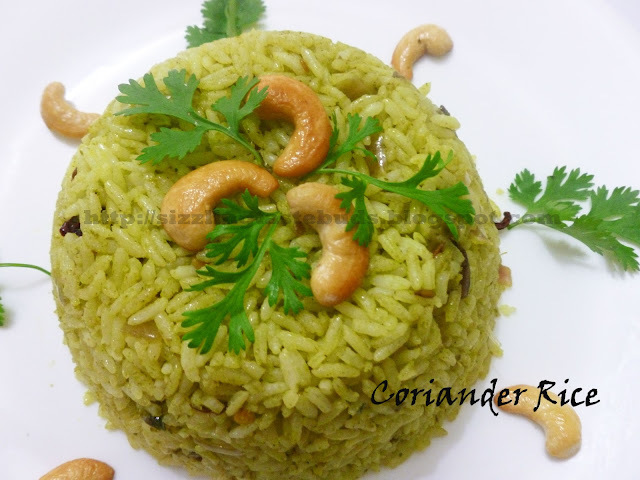 As the name indicates that this dish is prepared with fresh coriander leaves paste balanced with whole spices to give a flavorful and tasty, colorful rice. Its perfecte dish to go in for kids lunch box. It tastes best with Onion- Yoghurt Raita. 1. Blend Fresh coriander leaves, jeera and green chillies to a fine paste. 2. Heat 1 tbsp of oil in a wok and roast Cashewnuts to golden brown and drain it. 3. In the same wok, temper bay leaf , cloves and cinnamon stick. 4. Add chopped onions and saute it till it turns light brown in color. 5. Add ginger- garlic paste and saute it for a minute. 6. Add Hadli, salt to taste and coriander paste/puree. Mix well and cook it in a low- medium heat till oil separates. 7. Add cooked rice and fluff gently. 8. Switch off the stove, Garnish it with roasted Cashews and serve this with Onion- Yoghurt Raita. am hesitant to grind coriander..but this looks inviting..wud give it a try..
Oh... It looks very yummy... The post which you had given on the making procedure of Coriander rice is very keen with simple preparation. The blog is also very nice by proving the easy recipes that helps the people to have the recipes with the making procedure. Thanks a lot.